As I'm tucked up in bed with a cold, I've decided to work on one of my New Year's resolutions for 2010, which is to read a total of 26 books before my 27th (gulp) birthday in December. This may not seem like a lot to you, and to be honest, had you told my 14-year-old self that, she would have scoffed too, because I used to read voraciously, never without a book by my side. These days, I'm lucky to get through a volume of short stories, if that, so I'm trying to amble my way through the plethora of paperbacks I've picked up from the pulp shelf at work. 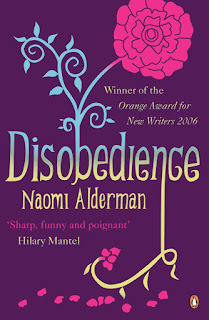 I was quite surprised, after beginning Naomi Alderman's debut novel, 'Disobedience', at the incongruous jacket cover to the words. The pink and purple color scheme and the ornate font with (what is supposed to be) a hydrangea growing out of the 'b' conjures up ideas of affairs, betrayals, and other stereotypical "chick lit" fare. It does a disservice to Naomi Alderman, for I doubt that was what she was trying to achieve with this novel. 'Disobedience' follows Ronit, a thirty-something (31) woman who returns to Hendon, London after her estranged father (the Rav, a highly respected and significant figure in the Orthodox Jewish community of Hendon) has died. We learn, over the course of first-person narrative interspersed between a third-person "voice", that Ronit is a lesbian (who is also having an affair with a married man in NYC, so the jacket cover wasn't that misleading after all), that she wanted desperately to escape the small-town mentality of her Orthodox Jewish roots, and that she had a childhood/teenage affair with her best schoolfriend, Esti (whom we learn more about as the book develops) who is now married to Dovid, the Rav's successor. As a novel, Alderman does not quite succeed in fully developing her characters or making the book believable. Dina Rabinovitch's Guardian review says it perfectly: "None of the personalities here gets beyond the two-dimensional. Her characters are flattened by the dead weight of meaning each is expected to bear; like the interpretation-heavy dreams with which she punctuates this story, nobody in this novel leaves any room for misunderstanding." In short, it's readable, but not exceptional; like something that is the product of an MA Creative Writing course, which is afterall, Alderman's own literary background. What I did relate to, however, is Ronit's sense of un-belonging; she is neither here nor there, in London or New York. She criticizes the Jewish community within Hendon and even mocks their "Britishness", naming their behavior both "admirable and hateful" but seems to also criticize the Jews in New York, who are not "Jewish" enough to her standards and the way she was raised - that they would never understand the way of life she was raised to live as an Orthodox Jew. But Alderman does not seek to solve this crisis or conflict in Ronit. Not through self-introspection, not through her appointments with her therapist. No, Alderman exposes this conflict and lets it rest there, lets it linger throughout the book. And I appreciate that, at least. For I too, often feel this sense of un-belonging, which is why I think I moved to London in the first place. I, at once, both love and loathe America, I don't feel "American" and yet my manner and my accent betrays the way I view myself. I'm obviously not British, I'm a visitor in this foreign land and I'm not trying to make it my home, but trying to make it homely for my stay. And then there's the complication of being Chinese as well - which, perhaps shouldn't be a "complication" but rather a "blessing", if you'd like. I definitely don't feel a sense of belonging in the Chinese-American community in the US and feel as at home in Hong Kong as an alien on earth. In England, I can be a complete stranger, a visitor. I don't have to wrestle with the tortuous thought of only "half-belonging". So in this way, I relate to Ronit. And maybe I read too much into her character and this conflict didn't exist. Maybe I made it up. But as she debates "should I stay or should I go" and weighs her options, I weigh mine with her. I don't know where I belong and I'm trying to be ok with that. excellent psychoanalysis on your "belonging". i feel for you.